When you swallow an entire star that's roughly twice the size of our Sun, you're going to unleash one helluva burp. At least, that's a fun and very unscientific way of looking at new research astronomers published in a recent study after observing a massive eruption in a pair of distant colliding galaxies. Scientists said they saw a black hole with 20 million times the mass of the Sun rip a star apart and spew a massive jet of fiery particles into space at a little under the speed of light, according to a release summarizing the findings by NASA's Jet Propulsion Laboratory. The jet of particles alone contained about 125 billion times the amount of energy put out by the sun in a year. Big burp indeed. The intense death and destruction of a star, known as a Tidal Disruption Event (TDE), has only been detected and observed by scientists a small number of times so far. The latest one, which the researchers initially thought was a supernova in the constellation Ursa Major some 150 million light years from Earth, provides new insights into what happens when a star is devoured this way. The team, led by Seppo Mattila of the University of Turku in Finland and Miguel Perez-Torres of the Astrophysical Institute of Andalusia in Spain, used radio and infrared telescopes to capture the event. 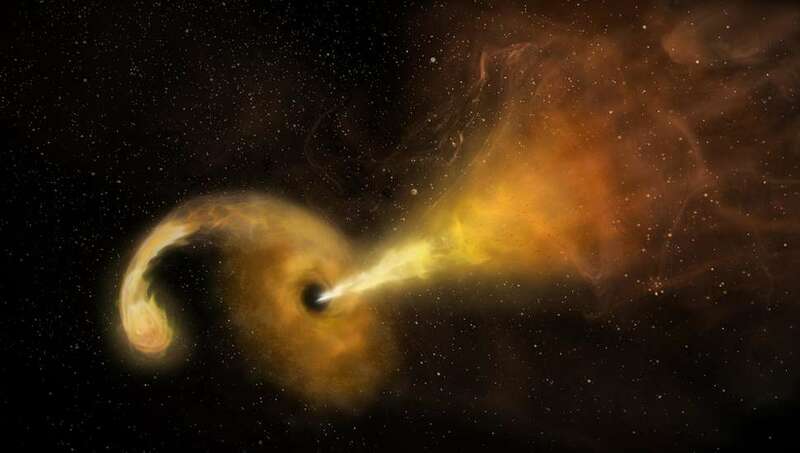 What they saw sounds insane: the wayward star passed too close the black hole and was subsequently ripped into a stream of hot gas, according to a report by The New York Times. Half the gas swirled around the black hole like water going down a drain while the other half was ejected into space by pressure from all the swirling material, forming the insane high-speed jet. 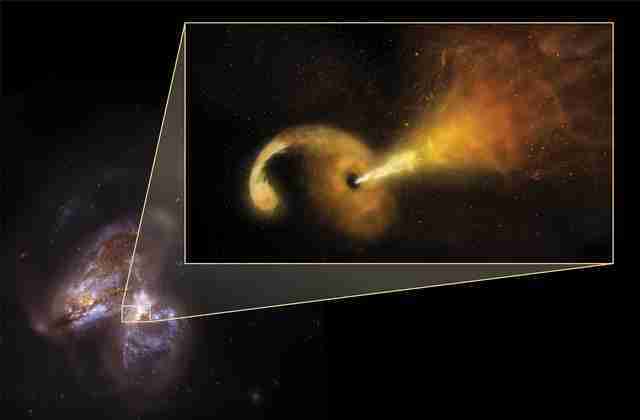 “This is the first time scientists have witnessed by direct imaging a rapidly expanding outflow, a so called jet, launched by a tidal disruption of a star by a massive black hole at the center of a galaxy,” Mattila told the Times. Studying these events may end up helping astronomers learn more about the how galaxies developed billions of years ago. "Because of the dust that absorbed any visible light, this particular tidal disruption event may be just the tip of the iceberg of what until now has been a hidden population," Mattila said in a statement. "By looking for these events with infrared and radio telescopes, we may be able to discover many more, and learn from them." At the very least, we can all appreciate how insane it is that black holes swallow stars and belch fire. Tony Merevick is Senior News Editor at Thrillist and loves space stuff. Send news tips to news@thrillist.com and follow him on Twitter @tonymerevick.